You can export to web and access your plan via any web-enabled device, including an iPad. 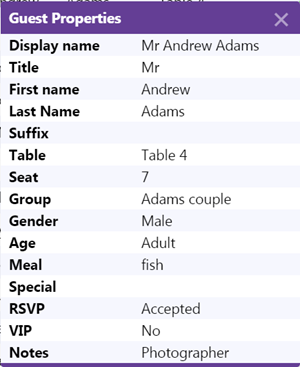 The web version of the plan contains all the information about guests, groups and tables. For example, you could have a single laptop running PerfectTablePlan at a venue and 5 people viewing the plan using a web browser on their iPads via wifi. Any changes you make on the laptop and export to the web are then pushed out simultaneously to all 5 iPads. Hovering over a guest in the left pane shows where they are seated in the right pane. You can also search guests and groups and change between interfaces more suitable for mouse-based and touch-based devices. You can’t edit the plan from a web browser, but you can re-export your plan to web and anyone looking at the plan in a browser will automatically be prompted on whether they wish to load the updates. Note Web export is via our server. We provide this as a free service. We cannot guarantee 100% availability. If the device has an email connection and can display PDFs you can also export to PDF and then email it to the device as an attachment. You can also share PDFs with an iPad using Dropbox or iTunes + the free iBooks app.